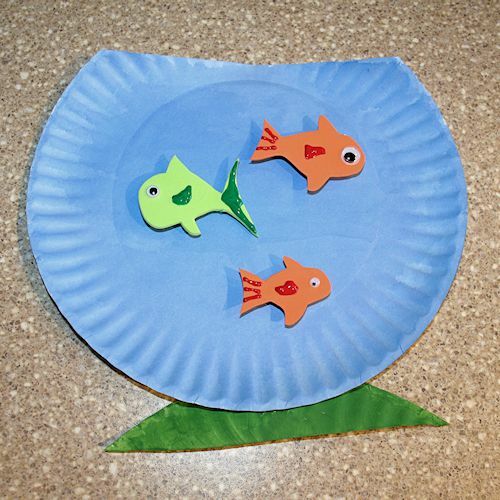 All you need to create this cute fish bowl craft is a paper plate, some craft foam, and some paint. You can create simple goldfish to fill your bowl or even fill your bowl with more exotic looking fish. Cut a small piece off of one edge of the paper plate as shown in the photo. Start out by painting the top side of the paper plate blue. This will be the fishbowl full of water. Paint the back side of the small piece of the paper plate a different color. This will be the bottom 'stand' of the fishbowl. Glue the stand to the bottom of the fishbowl as shown. Cut a few fish shapes out of craft foam. Make them whatever size and color you like, just make sure they will fit inside the fish bowl! Glue a wiggle eye onto each fish you cut out. This step is optional but recommended if you'd like to add some extra flair to your project. Use dimensional paint to add detail to your fish. When you glue your fish to your fishbowl, you want them to look like they are swimming freely. To accomplish this, cut 3 small scraps from your craft foam for each fish you have. Decide where you want the fish to be in the fishbowl, and glue a stack of 3 craft foam pieces on top of each other. Finally, glue your fish onto the craft foam stacks on your fish bowl. Let the glue dry!